Fire up barbie, it’s grilling season! 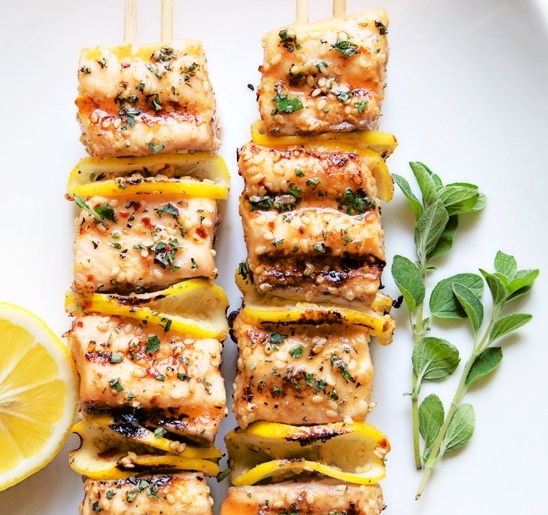 Cooking outdoors makes dining special and with Ann Vogel’s Salmon Kabobs, it’s elegant and pretty darned easy. Grilling adds another dimension to foods and even more so when you add soaked cherry, alder or apple wood chips for a softer, smoky flavor and aroma. Even better throw on some frozen corncobs for a really sweet smoky aroma. There are two wines that are the top match here. It’s too hard to make the choice so we’ll suggest one of each – Chardonnay and Pinot Noir. You just can’t get a better match with salmon. A great Chardonnay, full of vibrant fruit, comes from a cool climate. Mountainous areas or nearby valleys that hold fog all morning similar to Burgundy, Carneros, Santa Barbara or Mendocino are ideal. With any of these regions on the label, you’re in like Flynn. Traditional techniques like whole cluster pressing, barrel fermentation, and sur lie give the wines elegance and richness with balance from the acidity and tannins making it an excellent companion to salmon. The Chardonnay should have a little oak, some apple, citrus and buttery flavors, medium to heavy bodied. It needs good acidity to stand up to the fatty (the good kind) salmon. From Washington, Abeja, Dusted Valley, Rulo or Waterbrook would work very well with the salmon. California Chardonnay producers on my A list would be Beringer, J Lohr Riverstone, Ferrari Carrano, Wente Vineyards and Chateau St Jean. The most recommended perfect pairing of all time is salmon with Pinot Noir. Especially a wine on the younger side from Oregon or California. Typically, Pinot Noirs take about 5 -7 years to blossom. A 2008 from Oregon, 2009 or 2010 from California would be my first choice. Pinot Noir much like Chardonnay prefers a cool growing climate. In France, where the grape originates, its foggy regions are Burgundy and Champagne. Unlike Chardonnay, Pinot Noir is red and difficult to grow. So, why bother you ask? If you ask a dozen professionals what their all time favorite bottle of red wine was, I’ll bet you 50 cents it was a red Burgundy. My all time favorite was Domaine Ponsot 1985. Pinot Noir is a light to medium bodied red wine made from grapes that don’t have as many anthocyanins as other red grapes. This means it’s typically lighter in color than other red wines. But don’t let color fool you. You still get buckets of character with strawberry, cherry, raspberry and blackberry fruit and earth-driven layers with herbs, mushroom, tobacco, and leather. Spice notes also make their way into the glass in the form of cinnamon, clove and smoky nuances. If you ever get the chance, never shy away from William Selyem Sonoma Coast Hirsch Vineyard Pinot Noir. It will be memorable. Other fabulous Pinots are Rochioli in the Russian River Valley, Byron in the small cool Santa Maria appellation and anything from Bien Nacido Vineyards. California producers who know their way around Pinot Noir would be Martin Ray Santa Barbara, Rodney Strong Russian River, Acacia, Olema Sonoma, and Morgan in the Santa Lucia Highlands, to name a few. Oregon producers high on the list would be anything from Tony Soter, Argyle, Firesteed, Ponzi, and Wine by Joe. We’re starting to sound like a broken record, but we can’t help it. When you have two ladies that love chardonnay as much as we do, it’s going to end up being our “go to” wine when it comes to certain pairings. After a quick skim over the ingredients list for Ann Vogel’s macadamia nut crusted chicken and fish recipes, it became clear a chardonnay would be the best match for these rich summer dishes. The tropical fruit notes in the wine we have in mind will match the tropical flavors in the mango salsa, while the crisp acidity will match the richness of the dish. For this dish we recommend the Pedroncelli Dry Creek Valley Chardonnay. From California’s Sonoma County, this chardonnay doesn’t fit the stereotypical flavor profile of a California chardonnay — you know the heavy, in your face oak kind of chard. Instead this wine is crisp with refreshing notes of citrus and melon and tropical fruit aromas. The wine is a blend of grapes that were fermented in stainless steel tanks and those that were fermented in the barrel. The end result is wine with fruit-forward acidity that balances well with the hints of oak. 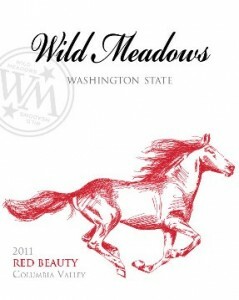 We recently served this wine at a wine tasting dinner we hosted in Gig Harbor. We paired the wine with a corn and crab chowder and according to our dinner guests it was the perfect match. The richness of the chowder was balanced by the clean, light finish of the wine. The wine should have the same effect on Vogel’s dish. We bought our bottle at Central Market in Poulsbo for just under $12. No this isn’t a lesson in spelling, or early childhood education. Those who have been around the wine world in the last decade, or two, may have heard the term “ABC”. So what does it mean? While it’s almost blasphemous to tell you since we love this wine varietal, we’ll take one for the team for the sake of wine education. The truth is chardonnays don’t have to be full of butter and oak flavors. After winemakers realized this, a better mix of chardonnays started to make their way to the market. Now you still have the option of the heavy, oak-laden chard, but you also can choose to drink one that preserves the citrus and tart green apple flavors of the versatile grape. This is a first for us, but we got to thinking that for a casserole loved by someone who cherishes her box dinners — especially those that can easily be cooked in a microwave — we should follow the box theme. That’s why we’ve opted to recommend a box wine. Now before you throw your noses in the air and click away in disgust, take a minute to hear us out. Boxed wines have come a long way since the days Franzia’s boxed wine ruled the scene. Many winemakers are realizing that boxes — well actually airtight bags inside a box — are a great way to serve wine once they are opened. Unlike their glass counterparts with a cork or a screw top, boxed wines actually preserve wines longer. That’s because there’s less chance for oxygen to get in the bottle and change the character of the wine. In France, it’s not uncommon to see wines in boxes, and even smaller containers with plastic twist off tops — think orange juice or soy milk tops — that are air tight. Italy has sold individual servings complete with a straw. As box wine becomes more widely accepted, winemakers are starting to put higher quality wines in these containers. The cost of producing wine goes down too because the cost of the containers went down. There’s probably still some resistance — not because the boxes aren’t good vessels to hold the wine, but because consumers tend to turn their noses at the mere implication that a good wine could come in anything other than a bottle. Even restaurants use box wine because it has a longer shelf life than a bottle, no matter the size. For those who have embraced the box and are using it to sell good-quality wine, the experience is great for the wine drinker. And the beauty is the wine will last longer than if you had the same wine in a bottle. So what wine would we recommend for Mrs. Brewster’s Casserole? We’re going with our fall back favorite, Chardonnay. But we figured since we’re recommending Chardonnay in a box we’d get a pass for recommending a wine we tend to favor. Look to Black Box or Wine Cube from Target as your choices. Each received top reviews from Wine Spectator (Wine Cube’s 2007 California Chardonnay received 88 points; Black Box’s 2008 Monterey California Chardonnay received 87 points). Tasting notes for the full-bodied Wine Box Chardonnay include apples, melon, citrus and a delicate floral note with hints of creamy vanilla; Black Box tasting notes include tropical fruit aromas of pineapple and banana accented by hints of floral spice and creamy oak. The Black Box runs about $25 for a box — which is the equivalent of 4, 750ml bottles. The Wine Cube can be purchased in either a 3-liter cube for $18 or, if you’re uncertain whether you want that large of a box, you can purchase a four-pack of 250ml bottles for $10. And if you’re enjoying a glass of house wine at a restaurant, be sure to ask who the producer is. It’s been a while since we’ve waxed poetic about Chardonnay, so this time instead of us talking about what we love, I thought I’d send you over to the Washington Wine Report. Blogger Sean Sullivan not only rates some top-notch Chardonnays coming out of Washington, he has links to other publications (including stories he’s written) on the delectable grape. White wine goes with fish, right? Well maybe. With Carter’s recipe — thanks Carter! — for ahi tuna with ginger-shiitake cream sauce, the ginger immediately makes us think Chardonnay. It’s probably clear by now that we love Chardonnay, but that’s because it’s a great white wine that pairs well with dishes of varying styles. Ginger makes us think of Chardonnay because the two have an affinity for each other – possibly because of the dryness of the Chardonnay and the piquant characteristic of the root. Beyond this affinity, Chardonnay has the body to match the meatiness of the ahi. But since we recommended a Chardonnay with Ann Vogel’s recent Iowa Stuffed Chop recipe, we’re going to stay away from Chardonnay this time and instead recommend red wine to pair with the tuna. Because of the density of the fish, we recommend a Pinot Noir or a Pinotage. Pinotage is a South African red grape that is the result of a cross between the Pinot Noir and Cinsault grapes. Both wine varietals have weight and flavor that would pair well with Carter’s dish — which is made even richer by the shiitake mushroom sauce. If you’ve never tried a Pinotage, we recommend branching out for this meal. Look to the Goats du Roam winery for its interesting blend of Pinotage — 33 percent Pinotage, 22 percent Shiraz and 13 percent Grenache. There are four other grapes with lesser percentages also blended in this wine, which results in a medium-style red that would match the recipe’s ginger and soy nicely. If you’d rather stay with Pinot Noir, our favorite go-to Pinot is from Castle Rock. Castle Rock Winery is located in California and sources its grapes up and down the coast from California to Washington. Their wines are always affordable and dependably good. Pork chops are the perfect canvass for a wide range of food accompaniments. These all pair perfectly with “that other white meat.” So what wine also goes well with all these options, and the chops? Look no further than Chardonnay. Recognizing that there are several different styles of Chardonnay, here are some guidelines. The sweeter the sauce, the sweeter the wine needs to be. With an apple sauce, choose a wine that’s lightly oaked. If you have a ton of spice with the chops, lay low on the oak. With Ann Vogel’s “Stuffed Iowa Chops” and their apple glaze and apple stuffing, we recommend Chateau Ste. Michelle’s 2009 Chardonnay. Head winemaker Bob Bertheau describes the wine as food-friendly, with bright sweet citrus fruit character, subtle spice and oak nuances. Sounds like a perfect match for the apple-stuffed chops. Now for the perfect wine for the Baked Potato Soup (see above link for the recipe). We believe potatoes are the perfect vegetable (says the woman of Irish decent and her blond partner in crime who never met a carb she didn’t like). But seriously, potatoes are the perfect vegetable because the can be paired with just about any wine. For this recipe, Chardonnay would work because of the butter, onions and cream. If you were planning to serve Vogel’s pork chops and the soup together, stick with the previously mentioned Chateau Ste. Michelle Chardonnay. If you’re looking for a different white, Sauvignon Blanc is another smart choice because it goes well with cream dishes, celery and parsley. If red wine’s more your style, the recipe’s bacon and cream are two components that match up nicely with a Cabernet Sauvignon. Irishman David O’Reilly of Owen Roe Winery, based out of St. Paul, Ore., has a great red blend that would match everything in the cream soup. His 2009 Abbot’s Table (from Washington vineyards) is a blend of Zinfandel, Sangiovese, Cabernet Sauvignon, Syrah and Grenache. There’s also small amounts of Blaufrankish, Cabernet Franc, Malbec and Merlot. Owen Roe is going to be more expensive than the Chateau Ste. Michelle Chard, but it’s worth it.